How to work with the report designer and viewer from the command line - Fast Reports Inc. In addition to the libraries themselves, FastReport.Net also includes separate programs - Designer and Viewer. The first one, as you understand, is intended for creating and editing report templates. It has a report preview mode from which you can view the report, export it to the desired data format and send it to print. The Viewer is designed to view reports in fpx preview format. The report file in this format contains, besides the report template, also directly the data that will fill this report. That is, the * .fpx file is essentially a ready-to-view report. In terms of functionality, the Viewer is almost identical to the report preview mode in Designer. Actually, Designer compiles the report for viewing in fpx. Both of these programs have a graphical user interface. However, few people know that they can be run from the command line with parameters. Let's take a look at the way to work with Designer from the command line. If, on the command line, the directory with installed FastReport.Net is selected, then you can limit yourself to this command. Otherwise, you need either to move to the desired directory using the CD command, or add the path to Designer.exe. Where Report.frx is the name of the report template. If it is not in the currently selected directory, then you need to specify the path to this file. By executing this command, you will see a designer with an open report template, i.e. you can immediately start editing the report. If the path to the designer or to the report template contains spaces in the directory names, then you need to quote it - “My reports / Report.frx”. That is, you specify two parameters - the path to the report template and the key to start the preview mode. And now we will have look at the way to work with the Viewer program from the command line. Here you just need to specify the path to the executable file of the application. Where Report.fpx is the file path. This command will launch the program with the loaded report. It remains to set the print settings and run it only. If you run Viewer.exe / P, the print dialog with the settings will open. 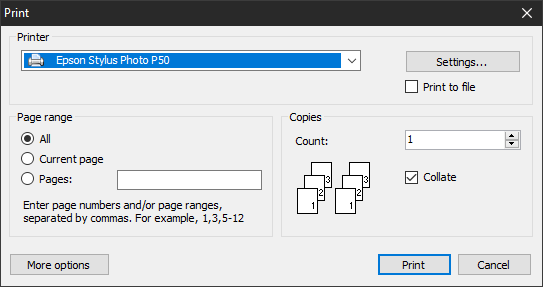 After clicking on "Print", a window with a command line will be displayed, which can be used later for "silent" printing on a particular printer. It can be copied with Ctrl + C and used later.